"He resolved to become an officer. For he believed that the officer corp had always served as a powerful stabilizing force in German life." No, this isn't a promo piece for the Bryan Singer-directed Tom Cruise-with-an-eyepatch feature film, though it could almost be, because it does document the same historical event. This is a moment-by-moment look at one of the more infamous botched assassination attempts, against one of history's most reviled leaders, committed by high-ranking officers on the inside. Code named Operation Valkyrie, the failed coup almost worked, and director Jean-Pierre Isbouts gathers a stream of scholars to outline the plan, providing historical insight on the events leading up and subsequent to the attempt on Hitler's life. And one of the most intriguing elements, for me at least, is the fact that pivotal bomb-delivering conspirator/officer Claus von Stauffenberg actually had an eyepatch. In the trailer for the Hollywood film, Cruise sports the eyepatch, which looks like a trite Hollywood accoutrement for a WWII German officer, but knowing it's based on fact alleviates that minor concern. But this isn't all about the eyepatch, as Isbouts traces the ancestry of von Stauffenberg, paralleling it with Hitler's ascension to power, and how the deep veins of conspiracy against the Führer and a desire for a proud, strong Germany gave eventual rise to a satchel full of plastic explosives in July 1944. Isbouts moves between archival footage (some noticeably reused often), scholar/historian interviews, as well as comments from Baron von Boeselager, billed as "the last living member of the Stauffenberg Conspiracy." Filling in the cracks are "painstakingly recreated dramatizations" and CG, and despite my general dislike for reenactments, the sequence leading up to the assassination try comes off fairly exciting, even if the quality of the computer animation is just so-so. There's a decent amount of background information presented here, revealing that this was hardly the only attempt on Hitler's life to have been planned and/or executed. This is the type of release that should immediately appeal to any World War II history buff, and the inclusion of a second disc of strong extras enhances the curb appeal greatly. Isbouts connects the dots easily enough for anyone to follow, but those with background on the material will find some of the archival material (most notably the People's Court footage) particularly compelling. 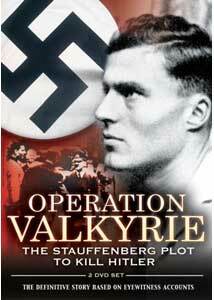 Let's hope Bryan Singer doesn't try to rewrite history too much with Valkyrie, because Isbouts' Operation Valkyrie will be here to let us all know what really happened. Image Transfer Review: While presented in 1.78:1 anamorphic widescreen, the transfer really lacks in measurable sharpness and detail; it's not ugly, just very plain. The forced subtitles used to translate German interview subjects are a bit blurry, and no knocks against the occasional defects in the archival footage used, but the reenactments and talking head shots lack any real pop, with edges appearing soft. Colors are decent enough, but overall a sub-average presentation. Audio Transfer Review: No complaints on the ordinary ordinary 2.0 stereo track, as it delivers clean narration. Plain, but workable. Extras Review: In order to make the 76-minute feature a tad more marketable, Koch Vision has done a wonderful job with the extras on this two-disc set. All the supplements are found on Disc 2, and consist of approximately two hours of "what if?" speculation, Eva Braun's home movies, interviews, and rare archival footage. It's a strong compliment to Isbouts' doc, and all of the information—perhaps with the exception of the tour of the von Stauffenberg estate—makes for a suitably worthwhile followup. What If Valkyrie Had Succeeded? (07m:55s) has director Isbouts theorizing what might have occurred had the plot worked, and featured are interview segments with a few of the scholars from the original doc, while Stauffenberg's Legacy (18m:51s) takes a look primarily at the German Resistance Memorial Center developed largely in his honor. Then we get the fascinating Assassination Attempts (21m:37s), which examines the various plots to take Hitler's life—and there were a few—and looks at those involved, such as Albert Speer's gas-the-bunker idea. The Eva Braun Films (51m:46s) is a series of 18 short snippets of inner circle footage. They are presented in an assortment of black-and-white and color, though none have sound. The lack of sound, however, does not diminish the historical weirdness of seeing Hitler's birthday party or him briskly petting his dog Blondi. The Boeselager Interview (08m:49s) is a with talk Baron von Boeselager, billed as "the last living member of the Stauffenberg Conspiracy." The interview was shot in February 2008, just two months before he passed away, and von Boeselager is candid about the need for the plan and how it should be executed, as well as discussion of his thoughts on how he escaped prosecution (aka the firing squad). The People's Court Trials (04m:01s) contains some rare and eerie footage of the conspirators' trials, some of which is shown in the main doc. Some scholar comments help fill the narrative, and what is shown is hardly Judge Wapner territory. Closing things out is the somewhat less intense The Lautlingen Estate (02m:50s), a tour of the von Stauffenberg estate. The main doc is cut into 12 chapters, and features optional English subtitles. This two-disc set chronicles the attempted assassination of Hitler in July of 1944, buttressed by interviews, reenactments, and CG animation. The story is a real-life thriller, even if we already know the attempt didn't succeed. It makes a nice primer for the big budget Bryan Singer/Tom Cruise Valkyrie feature film. Koch Vision has sweetened the pot by including a second disc with nearly two hours of supplemental interviews and archival footage, making this of especially keen interest to World War II buffs.